If you currently hold your own crypto, you are already familiar with the huge concern that is volatility. You could lose an important proportion of your wealth in a second, any second. What if the cryptocurrency you’re holding were not your own, but somebody else’s? And if you were holding the money of hundreds or thousands of clients? This is a problem that crypto businesses—exchanges, mining companies, retail, services, etc.—have had to deal with since the beginning. How do they hedge risk? On the other hand, if you’re an investor, how do you manage to speculate successfully in a volatile market? With derivatives. Not only do derivatives allow you to hedge; they are also heavy leverage speculation tools. Similarly, repo (repurchase agreements) are another tool that allows holders to turn price volatility into an advantage. So what are derivatives and repo, and how are they applied to crypto markets, and how do people profit from them? A derivative is a contract (a financial security) between two or more parties which derives its value from the price of some underlying financial asset. In the traditional market, the underlying assets are commonly bonds, commodities, currencies, interest rates, market indexes and stocks. In the crypto market, the underlying assets are, of course, cryptocurrencies. There are different types of derivatives, including (but not limited to) futures contracts, options, and swaps, futures being the most common. Futures are two-party contracts that obligate one party to purchase an asset and the other to sell that asset (whether a physical commodity or a financial instrument), at a specific date and time in the future. Today, you can trade futures contracts for cryptos on several exchanges; just like in the example above, they are contracts that establish one party who buys the crypto, and the other who must sell it to them at a specified price, at a specified point in the future. How do holders profit off crypto futures? Take for example, an investor who believes the price of Bitcoin will fall in the next 30 days. She may want to create a futures contract that obligates somebody else to buy 50 BTC from her at today’s price, by May 10. If by Apr. 28 Bitcoin’s price has, against her predictions, only gone up, she can sell the futures contract on a futures exchange to mitigate the loss, and even buy it back at a later date if there’s a crash in price (so long as it’s before May 10). Investors can purchase “buy” and “sell” contracts separately, which will allow them to go long or short respectively, depending on whether they think a crypto's price will surge or slump. Options, as the name indicates, present an option (a right) rather than an obligation to buy or sell. This tool is useful if someone wants to be able to sell an asset in the future, in case it depreciates, but doesn’t want to be forced to in case it doesn’t. Rather than risk it with a futures contract, you may want to pay another party a regular fee in exchange for the right to sell them. For example, you may pay another person a fee for the right to sell them a portion of your Bitcoin holdings a year from now for $5,000. That way, if BTC takes another fall, you won’t lose anything. Meanwhile, the person on the other side of the options contract will be ok, since they have been collecting fees to mitigate their loss. Simply put, swaps are the exchange of one security for another. A series of cash flows are agreed to be exchanged in the future based on interest-bearing instruments such as loans, bonds or notes, with interest swaps begin the most common. Interest swaps are the exchange of a future stream of fixed interest rate payments for a stream of floating rate payments. In traditional financial markets, a repo transaction (a.k.a. a repurchase agreement), is a form of short-term borrowing in which one party sells an asset (like a portfolio of bonds, or government securities) to another in exchange for cash, promising to buy the assets back at an agreed future date, for an agreed price. These transactions are normally treated as secured loans. The asset sold acts as collateral in the meantime, which makes it a fairly safe investment. A common example of a repo transaction in the traditional financial market is when a dealer sells government securities to investors overnight and buys them back the next day. With crypto assets its basically the same deal; you buy/sell some crypto from/to someone who promises to sell/buy it back later. This is, at its core, a way to get some benefit out of assets that are just sitting in a wallet, possibly depreciating. Though different from a derivative, the general objective behind them is quite similar. A plethora of platforms, both crypto and traditional, allow holders to deal with crypto derivatives, repo and simple loans. Here are just a few. Bitcoin futures began trading on the Chicago Board Options Exchange’s (CBOE’s) futures exchange (the CFE platform) in December 2017. CBOE Bitcoin futures (ticker XBT) are cash-settled futures contracts based on the Gemini Exchange’s (the Winklevoss twins’ platform) auction price for Bitcoin in U.S. dollars. The first contract was set to expire January 2018, at a settlement price of $15,700. Though there was not much volume being traded, the CBOE website did temporarily crash due to traffic when the futures launched. CBOE prices contracts with a single auction at 4 pm on the final settlement date. It uses bitcoin prices from the Winklevoss’s Gemini exchange to calculate contract value. Contract size is 1 BTC. In March 2019, the CBOE announced it would not be listing new Bitcoin futures for that month (although contracts already listed remain in operation; the last one will expire in June). This measure was allegedly taken in order to “(assess) its approach with respect to how it plans to continue to offer digital asset derivatives for trading.” However, some have speculated the CBOE has had a problem keeping up with competition. CME Group started out over 100 years ago as a place for farmers to lock in prices for their crops. Today, they are the world’s largest futures exchange, covering 150 countries. Though they announced Bitcoin futures launching before the CBOE, the final launch arrived just a little after, but they have, by now, recovered for lost time. On CME, you can trade futures, options, cash and OTC markets. CME contracts are based on the Bitcoin Reference Rate (BRR) index, which aggregates bitcoin trading activity across four bitcoin exchanges - itBit, Kraken, BitStamp, and GDAX - between 3pm and 4pm GMT. CME futures contract size is 5 BTC. Bakkt platform has plans to issue Bitcoin futures as well. We will have to wait to know more details, however; launch is set for late 2019, as the platform waits for the United States Commodity Futures Trading Commission’s (CFTC’s) approval. dYdX is a protocol for decentralized derivatives and margin trading. It allows users go short or get leverage on any Ethereum-based cryptocurrency with margin tokens, which digitally represent these positions in ERC-20 form. In other words, they’ve created a Short Ethereum token (sETH)” They've also launched a Leveraged Ethereum (LETH). Both use DAI as the quote currency. Oxygen, created by ex-Goldman Sachs executive Alex Grebnev and the founders of Changelly, is a crypto repo platform. It targets B2C and B2B crypto markets. On Oxygen, institutions and people who hold ERC-20 tokens can attempt to turn a profit by lending them to the public (taking another asset as collateral in the meantime), and those who don’t can borrow assets and try to go short. SALT is a lending platform. To be clear, the platform lends Bitcoin and ERC-20 coins (putting up an asset as collateral) to users, but, unlike Oxygen, it does not allow user to lend crypto. Also unlike Oxygen, SALT gives out loans in US Dollar. SALT is a good option for holders looking to make some cash on their crypto assets, but not for those looking to trade. Further, SALT is limited in the number of currencies the user can borrow. Borrowing terms range from 1 to 36 months, and rates start at 5.99%. SALT accepts Bitcoin, Ethereum, Litecoin, Dogecoin, USD Coin and TUSD Coins. Earlier this year, Xena Exchange launched XGRAM, a cryptocurrency-settled derivative contract whereby people can trade Telegram’s not-yet-publicly-released GRAM token. Telegram’s ICO to build a decentralized platform on its messaging app was the highest grossing ever, and by a long shot — it’s $1.7 billion blew Filecoin’s $250 million out of the water. Already awash with criticism (Pantera Capital’s Charles Noyes called it “opportunistic (…) essentially a wishlist of things they want to have,” and the MIT Technology Review called it “bold but short on ideas.”), things took a downturn when early backers started selling their GRAM tokens for a profit, before they have been made available to the public (the ICO’s public sale piece was cancelled shortly after raising its $1.7 billion, and the token is still not available on exchanges). How do derivative trading and repo platforms make money? Very simply: they charge fees for transactions, same as a normal exchange. Overall, crypto derivatives have the power to not just lower risks for individual investors, but also for the cryptocurrency market as a whole, which, in turn, attracts more investors, drives greater volumes, and lowers the resistance that government and traditional sectors may have towards bitcoin (and other coins) becoming an accepted asset class. That’s why the generalized reception of crypto derivatives in the community was positive and hopeful. “Many think that futures will help stabilize the price of bitcoin, as well as hasten its adoption by Wall Street, (and the) approval for future products like a bitcoin ETF” reported TechCrunch in December, 2017. Of course, for many crypto holders and investors, bringing institutions closer to crypto is a negative, not a positive; see “The downside of derivatives and repo” below. As for repo, Grebnev (Oxygen), has claimed that allowing people to raise liquidity against assets without selling them and get ahold of assets without buying them “is key for any efficient market.” (in conversation with Forbes). The truth is, repo transactions are a crucial component to modern financial markets: they account for over $12 trillion in the US and Europe, of which almost 80% are government bonds alone (Forbes). For many it seems tempting to emulate this in the crypto market. A sensible point against derivatives and repo is the danger they can pose to a market when they grow unchecked. Markets can crash if the value traded in derivatives exceeds the value of the assets they’re tracking by too much. Some (check here and here for examples) have posited that it would make more sense to encourage people to actually buy cryptos rather than deal mostly in derivatives, which could and affect their price indirectly. In mid 2018, Fundstrat’s Thomas Lee theorized that Bitcoin’s price crash was partly triggered by futures. 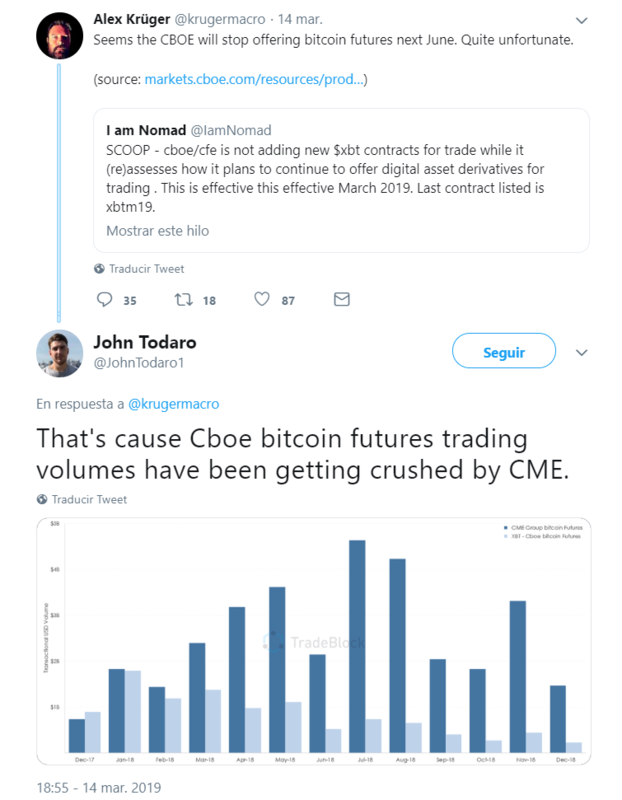 “Bitcoin sees dramatic price changes around CBOE futures expirations”, he wrote, adding “ (with two exceptions,) overall, bitcoin has fallen 18 percent in the 10 days prior to CBOE contract expiration.” Lee attributes this effect to the volatility that the contracts themselves experience around expiration dates. Creating markets for derivatives is a major step toward the acceptance of cryptos as mainstream financial instruments and a new asset class in its own right. With the advantages it offers to investors and companies, it could be hard to prevent the market from abusing these tools. Although there is no certainty that derivatives and repo are behind the bear market of 2018, as discussed above, some evidence does point to a possible connection. At this point, perhaps only regulation can avoid these situations; if so, the community will have to reveal in time whether they want this or not.